Solar Powered Post Top Lights are designed to perfectly fit any 4×4 post, so they are ideal for the tops of fences or deck posts. They also work very well for the banisters of exterior steps or stairs, to shed a bit of illumination, helping to prevent dangerous trips, slips and falls. Another option is to use these lights to line a walkway, pathway or driveway. 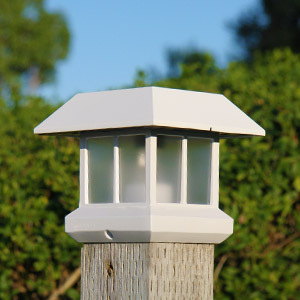 Solar Post Top Lights are extremely versatile, and can be used for a variety of applications. Solar post top lights look great during the day, but they are especially nice to have after dark, as they can be used to simply add a great ambience, or even provide functional lighting for dark spaces, walkways, driveways, etc. Interested in learning more? Check out our Solar Post Top Lights here.